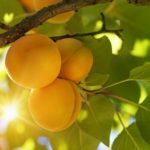 What Do I Do About Apricot Tree Fungus? My large apricot tree has a white fungus at the base of the trunk (on the trunk, not in the soil). It has been there awhile, and it did not affect this year's apricots (they were amazing!). Can you help me figure out what to do? Cut it out? Tree medicine? Would love some direction. Thanks!!!! You can treat it with a fungicide. Copper sulfate or neem oil works well. It sounds like it is just a cosmetic blemish, so there is nothing more you need to do than to treat it with this.